Celebrating Huron County’s first 150 years by preserving our County’s history is a task over a year and a half in the making. The Huron County Historical Society brought over 30 local authors together to make this new compilation as complete and inclusive as possible. The Society reached beyond its regular membership to include local historians and authors who have demonstrated a keen sense for recording the history of our county. The history and stories of towns and villages such as Parisville, Ruth, Kinde and Owendale, barely covered in earlier writings of our history are brought to life in much greater detail. Our four corner villages and country schools are also featured. Learn about our county’s first known inhabitants, the Sauk Nation, followed by the Ojibwa who resided here when the first French explorers arrived in the late 1600s. This land once belonged to France. Later, under British rule, our land was granted to the Colony of Virginia by the king of England. 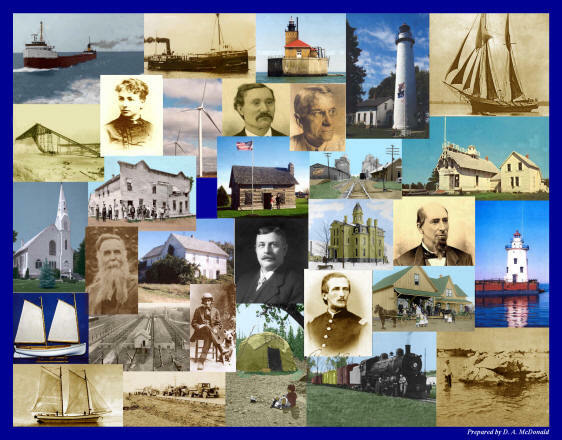 Read how our communities grew from four-corner beginnings along the shores and in the wilderness forest to build an industry in lumbering, fishing, railroading and even shipbuilding, and how the pioneers suffered through great forest fires to build the agricultural industry we know today. The Huron County Historical Society would like to thank Julie Purdy, Purdyville Publishing, LLC, for her vision and talent in preparing the book for publication and Carol Roggenbuck, Lakeshore Guardian, for designing the commemorative sesquicentennial logo. "Celebrating 150 Years" can be purchased at select area merchants and from local Historical Society Chapters. An order form and more information can be found here. You can also find our book at all of the local museums or call David McDonald at 989-551-0532 or Diane Ellicott at 989-712-0050 or use the order form at the link above. 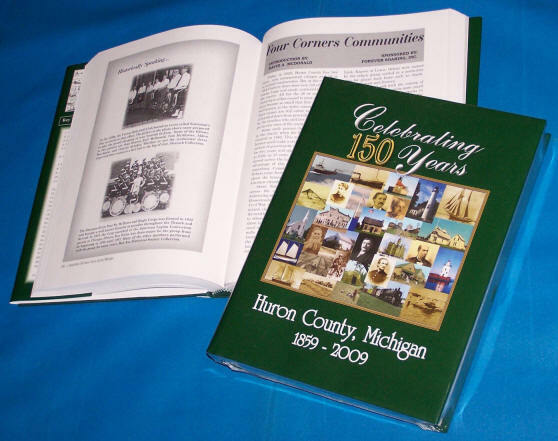 “Celebrating 150 Years” is a fabulous job of capturing the many, many dimensions of Huron County so well. You and your dedicated team can be very proud of this accomplishment! When the weather closes in, I look forward to the fireplace and reading the book and in particular the Maritime, Lighthouse, and People and Places sections. My congratulations to everyone involved. Photographs are terrific, descriptions well written, layout attractive and easy to navigate, and a wonderfully full scope all combine to preserve the past for the future! "Let me compliment you on the opening article in the book. I read it all. Especially welcome were the early maps and the picture of the Native dwelling. It is a wonderful opening for the book. Since, as a genealogist, I have been wandering undirected through the history of Michigan and Ontario off and on for years, it is welcome to come across a piece that spells it out chronologically and understandably. Thank you.